For the past two years, Health HUB has been working to assist uninsured community members with diabetes by helping them find pathways to care. The program is funded by a Catholic Health Initiatives Mission and Ministry Grant through June 30, 2014, implemented by community health workers and nursing professionals at Sentinel Health Care, and overseen by Buffalo County Community Partners, who provides a program coordinator. Health HUB is now serving 191 clients and has documented positive outcomes in each of its pathways. In addition to seeing a significant decrease in clients’ A1c test results, Health HUB has helped save Good Samaritan Hospital over $3.5 million in total costs of care, among other things. Through Health HUB’s Safety Net Pathway, clients are educated on the importance of having a primary care provider and on the appropriate use of the emergency room. By connecting clients with physicians, community health workers, and other primary care providers, Health HUB has decreased its clients’ use of the emergency room. After being enrolled in the program for over a year, 59 percent of clients have not been back to the emergency room for medical care, resulting in $3,529,475.66 in savings for Good Samaritan Hospital. In addition, Health HUB has maintained a 4-to-1 cost ratio of pre-emergency room costs to grant costs, better than the national recommendation of a 3-to-1 cost ratio. 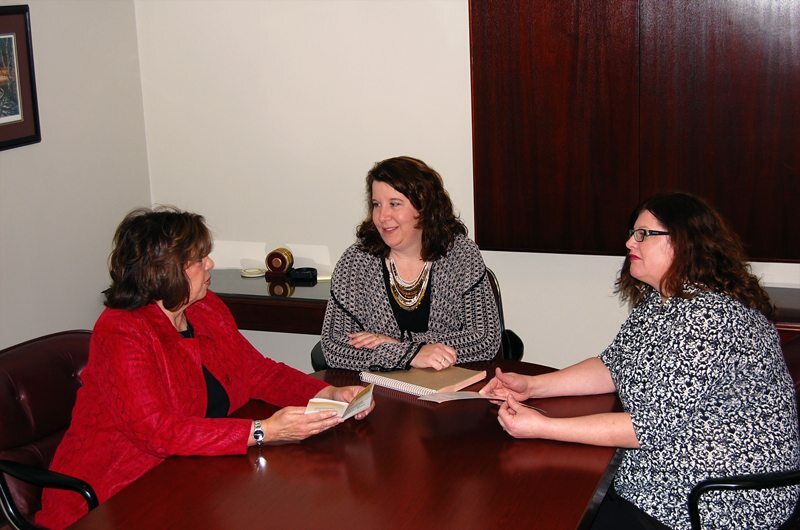 Carol Wahl, Denise Zwiener, and Crystal Winfield discuss the Health HUB program. Through Health HUB’s Medication Access Pathway, community health workers educate clients on the importance of taking medication regularly and assist clients in obtaining medication. Working with the Medication Access Program through Sentinel Health Care, 73 clients have been able to obtain 633 prescriptions, for a total savings of $302,554.07. Nearly 45 percent of Health HUB clients reported having social needs barriers that were preventing them from receiving adequate health care. Social barriers included limited access to food, housing, transportation, and child care; cultural, language, and literacy barriers; and financial instability. Through its Social Service Referral Pathway, Health HUB has helped 52 percent of those clients overcome their barriers. 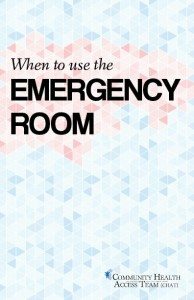 Health HUB’s “When to Use the Emergency Room” pamphlet explains when emergency care is required and when to consult with your primary care provider. Health HUB also has a Diabetes Education Pathway, which aims to provide education to clients and improve their ability to self-manage their diabetes. This has helped reduce the number of emergency room visits by Health HUB clients and resulted in a 1.2 percent decrease in clients’ A1c levels on average. The A1c test measures how much glucose is attached to someone’s hemoglobin and is one of the primary tests to diagnose diabetes, check blood sugar levels, and gauge the effectiveness of treatment and management. This decrease in A1c levels will significantly reduce clients’ chances of complications from diabetes, such as organ damage and amputations. Health HUB’s fifth objective is the implementation of its Payment Source Pathway, which helps clients secure a stable form of payment so they can continue to see their primary care provider, receive medication, and better control their diabetes. This is done by assisting clients in applying for resources from the Center for Medicare/Medicaid Services (CMS), commercial payers, and other sources. By working with a community health worker, 38 percent of Health HUB clients who had medical debt were able to continue seeing their primary care provider. Even with the assistance of Health HUB and its resources, many clients are still unable to receive the care they need due to barriers within these pathways. To help resolve these issues, the Community Access Network (CAN) Team is developing a plan for a community clinic that addresses barriers to health care in our community. Information collected from Heath HUB’s work will be used in the planning process of that community clinic. While the CAN Team’s work will not come to fruition for several months, Health HUB will continue educating and assisting uninsured community members with diabetes.